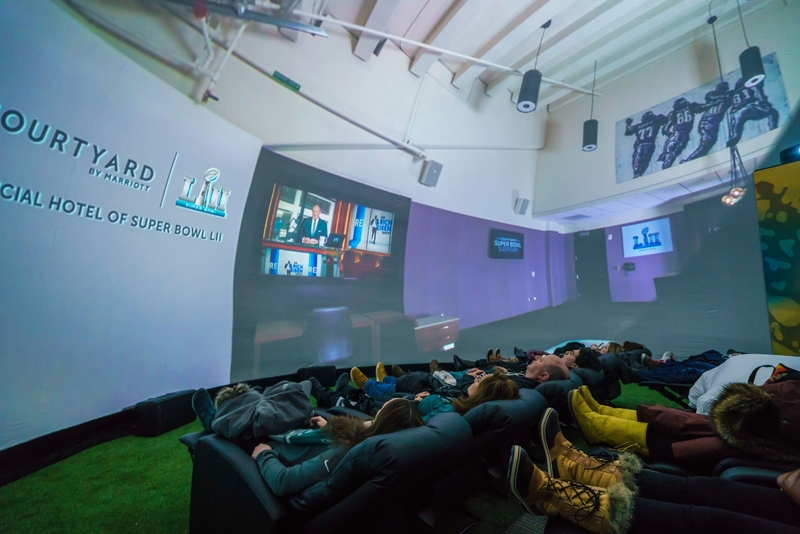 bluemedia Chooses 4Wall for Projection Domes and Video Mapping Projects at Super Bowl 52 | Press Center | 4Wall Entertainment, Inc.
Minneapolis, MN- The week-long pre-game festivities the Super Bowl brings to its hosting city ensures attendees never have a minute of downtime. Even if you don't have a ticket to the big game, fans can soak up the electric Super Bowl atmosphere. 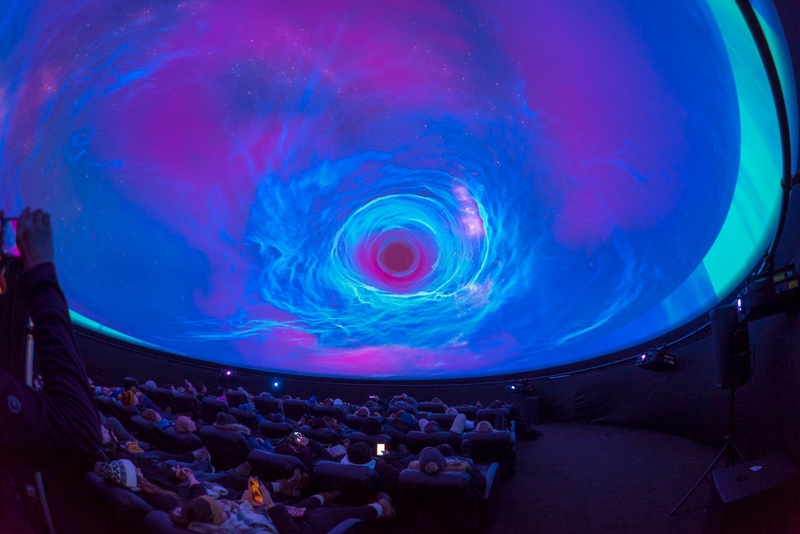 Industry leader in décor, custom fabrication and experiential activations for brands, bluemedia, was tasked to execute (2) projection domes along with (2) video mapping projects utilizing gear from 4Wall Entertainment. bluemedia's video mapping projects were located at the Hyatt Regency, which served as the official NFL Headquarters hotel. The projects included an exterior mapping on the building itself (180' x 145') featuring HD video of the Northern Lights and the Philadelphia Eagles and New England Patriots logos. 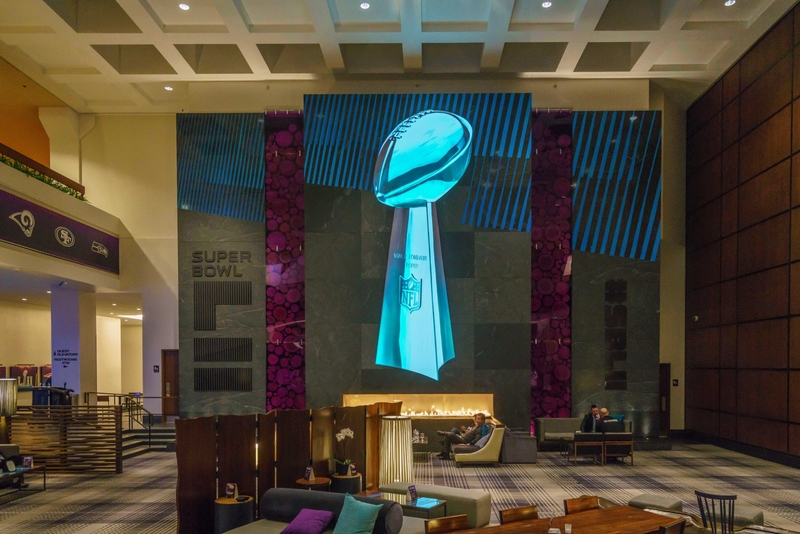 For the interior of the hotel, the bluemedia team video mapped a massive Vince Lombardi Trophy above a fireplace inside the lobby. "We needed to make sure our saturation and color levels were at the highest quality image possible, so we utilized the Barco UDX-4K32 laser projectors," explained bluemedia Executive Producer Paul Whitney. "One projector was used inside the lobby that had minimal ambient light and eight projectors were used for the massive exterior wall of the hotel." Two domes were erected for the 'Super Bowl LIVE presented by Verizon' experience and for the 'Courtyard by Marriot Super Bowl Sleepover Contest' created by IMG Live. 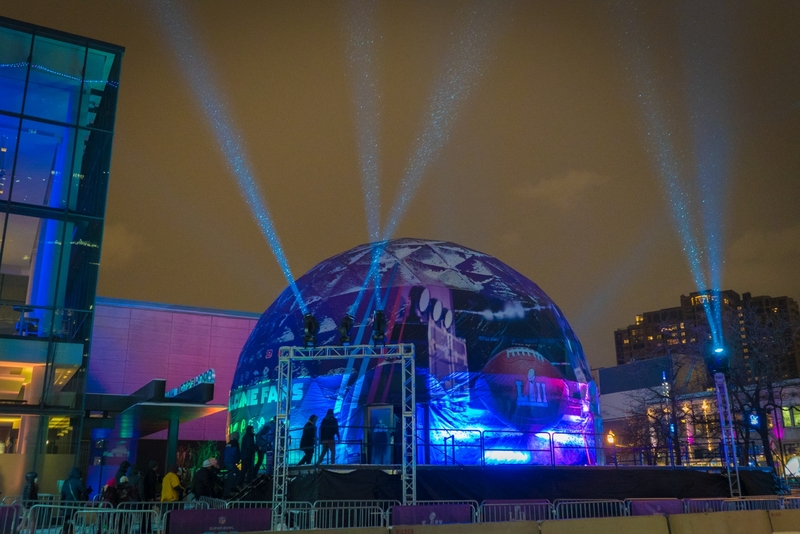 "The geodesic dome we constructed for 'Super Bowl LIVE' delivered an immersive, 3-D projected, 360-degree theater experience that took fans on the journey through the #BoldNorth," said Whitney. "Our dome was part of the many attractions at 'Super Bowl LIVE' and we were proud to be a part of such an amazing experience for the fans." 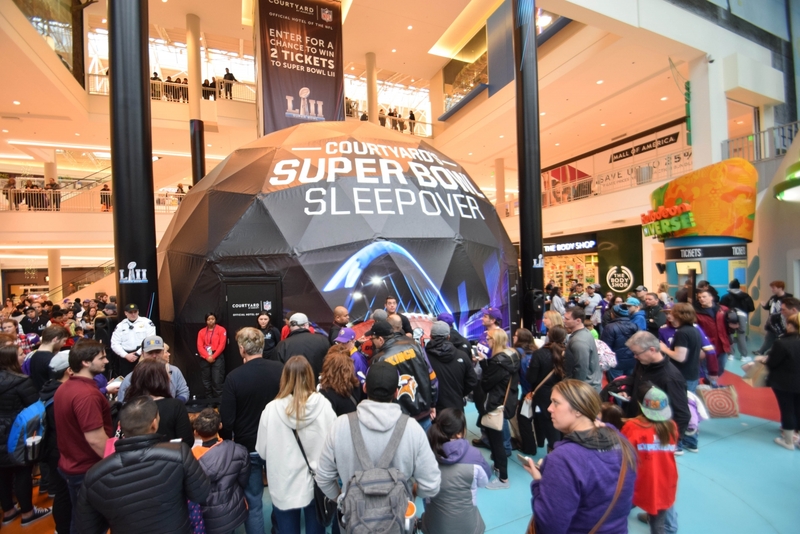 The 3rd annual 'Courtyard by Marriot Super Bowl Sleepover Contest' offers one lucky fan and their guest the opportunity to stay at the hosting Super Bowl stadium in a field level suite that has been transformed into a Courtyard hotel suite the night before the big game. 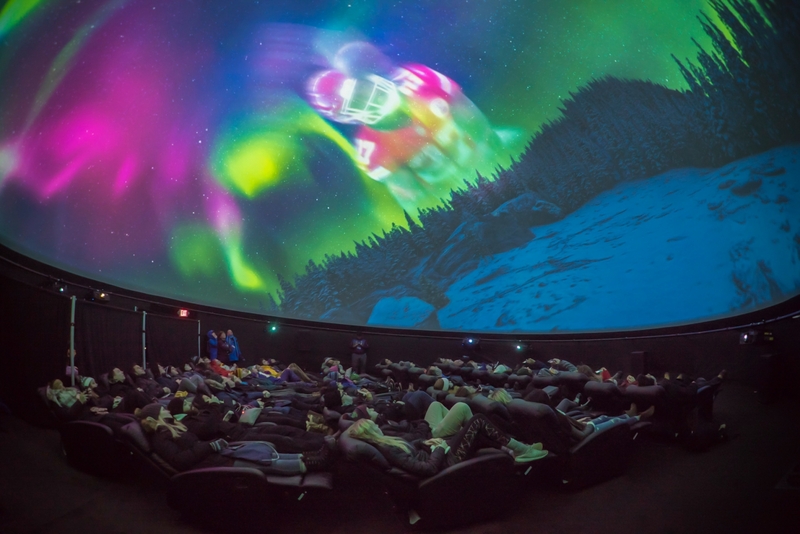 "To promote this sweepstake, we created an engaging dome experience where the fans would feel as if they were truly waking up inside the suite at U.S. Bank Stadium," said Whitney. 4Wall provided 12 Epson L1505U Laser WUXGA 3LCD Projectors for the dome projects. "With limited space within the domes, these were the perfect solution as we produced HD, captivating video content," explained Whitney. "These projectors supplied us with 4K resolution that gave us extraordinary color brightness along with brilliant imagery." Whitney spoke of the service and gear 4Wall provided. "Knowing our clients are of the highest caliber, we always need to make sure there are never glitches in our gear and or performance," said Whitney. "Their expertise is, bar none, the best in the industry and I completely trust our investment with 4Wall and their team of experts."